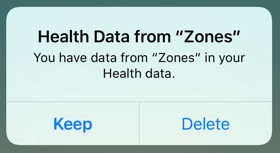 The workout datas recorded by Zones is saved in Apple Health. We don't have your record in any other server. Please note that you can not be restore health data deleted from Apple Health. You can leave workout datas even if you delete Zones iPhone app. 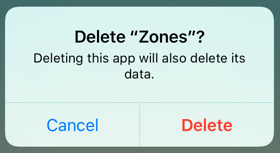 When trying to delete Zones iPhone app, the following dialog will be displayed. If you select "Delete", the following dialog will be displayed. Please select "Keep" if you want to keep the workout datas recorded with Zones. If you select "Delete", all workouts recorded by Zones will be deleted. You can not restore datas if you delete it. If you are using iOS 10 or Zones v1.3 or lower, you can not keep the data of the route map. Please update to the latest iOS and the latest Zones app and launch Zones iPhone app. Then, Zones app automatically adds your route map recorded in the past to Apple Health. Please migrate your datas using iPhone backup. Please refer to Backing up Apple Healthcare Information for how to backup. If you use iTunes's backup, please check "Encrypt iPhone backup". If you already purchased PRO, you can restore by "Restore Purchases" button on the "Upgrade to PRO". Please check Restore PRO purchase.